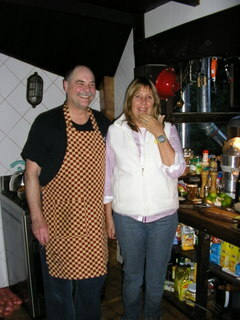 Late one evening, while two guests, Marcelo, Loreta and I, were having a small wine tasting and eating empanadas, the subject came up again, and I confirmed that I would. Ana was surprised and thrilled when told the next morning. 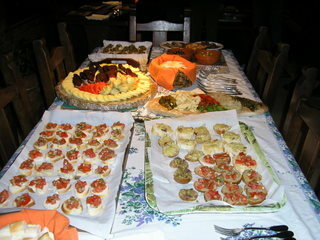 Several times a year she does a buffet for family, friends and any guests in the Posada. 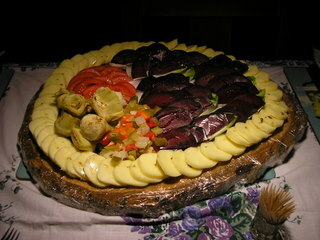 Since Good Friday is as important in Latin America than Easter itself, Ana asked if I would create a menu for 25 that did not contain meat - Good Friday is a meatless celebration. 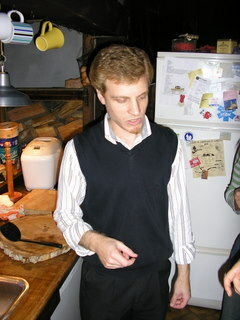 Guests were requested to provide wine. 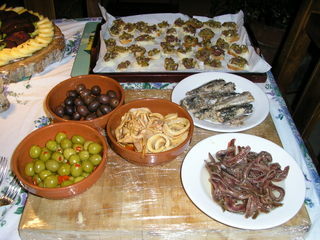 Anchovies, marinated calamari, roasted beets on Belgian endive, marinated mixed vegetables, green and black olives, mozzarella and sardines with lime. Roasted Vegetable Sauce: (1) Roast peppers, onions, garlic, carrots, fennel and tomatoes. (2) Skin and chop roasted vegetables. (3)Add salt, pepper, basil, oregano and slowly simmer for one hour on low heat. Dried Mushroom Tomato Sauce: (1) Soak dried mushrooms in 8 oz hot water for 20 minutes. (2) Drain but reserve the soaking liquid. Chop the dehydrated mushrooms. (3) Sauté fresh mushrooms, chopped onions and several garlic cloves in a little oil. (4) Add 8 oz of Sherry wine, the dried mushrooms and the soaking liquid, salt, pepper, basil, oregano, coriander seeds and tomato puree. (5) Simmer on low heat for one hour. Blush Sauce with Vodka: (1) Sauté one small chopped onion, several cloves of smashed garlic, and two chopped scallions in a little oil. 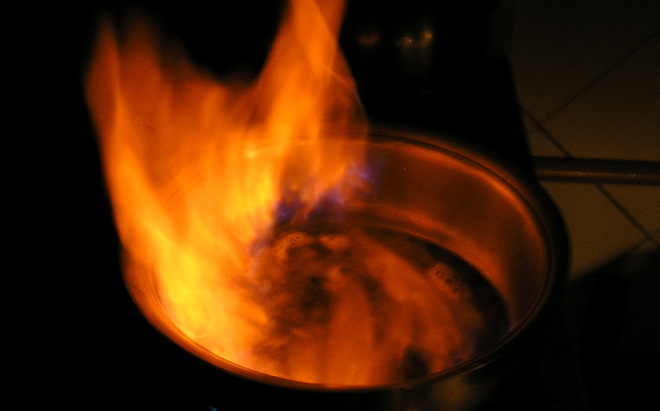 (2) Add 4 to 6 ounces of vodka and flame. If still flaming after 30 seconds, smother the flame with heavy cream and half that amount of tomato paste. Add basil, salt and white pepper and simmer until reduced by half. (3) Strain the sauce through cheesecloth and keep warm until serving time. I was given generous assistance by the staff and Ana’s visiting sons. 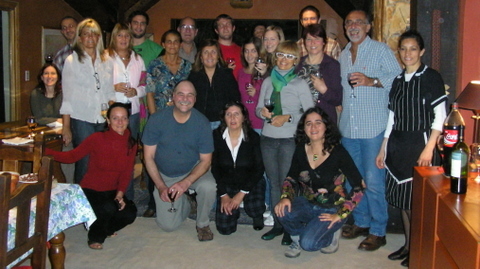 The guests were from Argentina, Spain, Germany, France, Brazil and the United States. 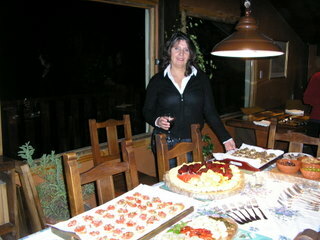 It was an evening that makes the Posada del Fin del Mundo, and Ushuaia, a special destination.